Can you really grind my coffee the way I want it? Yes, and now you can select how you want the coffee grounds on every coffee product page (for ground coffee). We offer everything from Coarse to Fine, including specialty grinds for Espresso, French Press, Turkish Coffee, Moka Pot, Vacuum Pot, Percolator, refillable K-Cups and more. Why is your coffee so inexpensive if it's true gourmet coffee? What farm in Costa Rica does your famous No. 42 brand coffee come from? The green coffee beans we acquire are, after careful analysis of the whole region, the best there is. Some coffee companies call it Geisha with an added i (which is actually a female Japanese entertainer), and some call it Gesha. We call it No. 42 because it was our 42nd coffee offering. We source the beans from a tiny family farm which is at high elevation with shade grown coffee fields that flourish on the edge of a mountain. The workers hand pick every coffee cherry, and hand wash them too. Matter of fact, they do it all by hand right down to the drying of the beans in natural sunlight with beans spread over wooden planks. The same way it was done hundreds of years ago, an old world method. No automated picking machines or careless processing. Hand selected beans, among the best anywhere in the world. We are sure you can not get coffee of this quality for the price we offer it anywhere else. In most cases you will pay about two dollars an ounce or more, but not here. It's not even a blend, it's a single origin coffee from Costa Rica. A blend commonly means a variety, large or small, of coffee beans from different locations around the world. It's popular for coffee companies to mix cheap coffee beans with premium coffee beans, and sell that coffee at premium prices. We do not believe in this, because single origin high grade coffee beans are loaded with quality. They are much better than any cheap blend. The term No. 42 actually came from trial and error roasting, where the 42 was our 42nd trial roast for Old Chicago Coffee's original. Many of the beans were in fact blended while others were single origin. The word 'blend' just kind of stuck. The difference between the final 2 blends (which we should really call roasts) were the farms the beans originated from. The 42nd roast was the winner by far, the coffee was unreal. Rich, bold and full of flavor, just what we were looking for. We stopped there, we had our farm that would supply all of our No. 42 brand coffee beans. How much coffee should I use in my coffee maker? The most common coffee makers are 10 cup, 12 cup or capsules like K-Cup. Some smaller machines that are popular today are 5 cup or less, but the best selling coffee makers are still 10 and 12 cup drip coffee makers, outselling capsules like K-Cup and Nespresso. There is a slight variation from one manufacturer to another, where a 12 cup pot by one company may be 60 ounces, and a 12 cup coffee by another may be 72 ounces. Most traditional coffee cups are 6 ounce, so that's why they make them in those sizes. Most coffee companies will recommend 1 to 2 tablespoons of coffee for every 6 ounces of water, but who knows exactly how much the coffee pot holds? They vary and it doesn't really tell you on the pot either. With this in mind there's an easier way. If you have a 12 cup coffee maker and you are making Old Chicago Coffee we recommend starting with about 1 to 1.5 tablespoons per cup. If you like your coffee with stronger flavor use 2 tablespoons - (adjust to taste as always). For a refillable K-Cup it is easiest to just fill it up and use less if it is a bit too strong. From time to time we offer free coffee samples, and those are for a single pot of coffee at 10 to 12 cups. Because our coffee is very fresh and offers bold flavor you probably do not need 2 tablespoons for 6 ounces of water. When coffee is old you do since it loses flavor, so you need a little more. Grocery store bought coffee is often 3 weeks to 2 months old before you get it. Ours is from the same week you order, quite possibly the most fresh coffee you have ever had. Don't be fooled by those coffee shops on every corner either, that coffee is rarely less than 3 weeks old before you buy that morning cup. I wanted to order but the coffee I want is sold out, is it coming back? Yes, we will have your coffee soon and you can still order now if you wish to be among the first in line for future shipments. Our coffee is sold out a lot because it is premium coffee at a wholesale price. When it comes in we start roasting and shipping, but it sells out fast. From time to time we sell every type of coffee we offer before the next shipment arrives, so supply is low and demand is high. They tell us that is a good problem to have, but it is also an inconvenience for you. We are working on getting more coffee with each shipment but we can only bring in what the farm can produce. If you order now you are guaranteed to beat the rush when it comes back in stock since your coffee will be the first to ship once the new shipment arrives and we start roasting. These coffee beans are perfect! What kind of coffee roaster do you use to make the coffee I buy? We have used different roasters, including our own, designed by Old Chicago Coffee and made for us exclusively. No other roasts the way we do. The roaster is part of the great taste, it's not just the beans that make Old Chicago so good. Do you offer flavored coffees like pumpkin spice, cinnamon roast or cherry? We offer Pumpkin Spice and Cinnamon 'Toast'. We may offer a French Vanilla, Cherry and others as well as a few other favorites like Caramel and Chocolate in the near future, but currently we sell out fast as it is with our Light, Medium and Dark Roast coffees. That is part of the reason why we have not offered many flavored coffees yet. I am looking for decaf ground coffee but I have not been able to find it on your site, do you offer decaffeinated coffee? Yes we do. Just search for decaffeinated in our search box. I am in Chicago and I want to try your coffee, where is your coffee shop at? Old Chicago Coffee is a roasting company, not a coffee shop. We sell coffee in bean and ground form to coffee shops, restaurants and grocery stores but we do not currently offer cups of coffee in our own coffee shop or cafe. 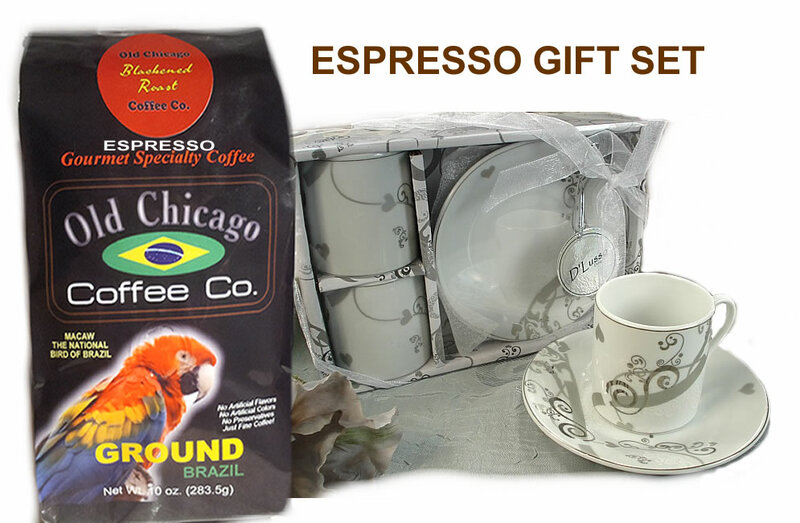 If you order coffee from our online shop you can expect to receive it very quick since we ship our coffee direct from our warehouse in the Chicagoland area every business day, out of Orland Park. I have had your coffee and the beans are to die for. Can I buy a bulk amount for home roasting? We now offer green coffee beans in 2.5 pound packages. Our coffee sells too fast so we only offer beans in small amounts. Ten bag case pricing on roasted and green coffee beans is also available, contact us for details. I want to offer your coffee as favors for a party. Can I buy mini coffee bags? Yes, we can help you with that. Contact us for information. How long is coffee good for? Does coffee expire? How to make it stay fresh longer?